The recent changes in the weather pattern all over the globe are clearly showing the dangers of global warming. It is feared that the climatic disturbance will create several disasters in different parts of the world due to extreme heat, drought, melting of ice in Arctic and Antarctica etc. Therefore, it is the responsibility of every person and every country to take steps in order to prevent or at least reduce the speed of climate change. Different countries are progressing in the field of green business in order to take part in these efforts. Reduction in coal and fossil fuels, using green products etc. are few such measures taken by different countries for this purpose. Oil and gas is the main revenue driven industry in the Middle East region. It provides immense wealth to the countries in the area but the same industry is making the place as one of the most polluted ones in the world. UAE is the most innovative country in the whole MENA (Middle East & North Africa) region and one of the most innovative in the whole world. The administration is aware about the demands of the modern world and they are moving ahead towards a healthy and clean living for their citizens and residents. In this regard, the government has taken several important measures that are increasing the prospects for businesses related to green technology. 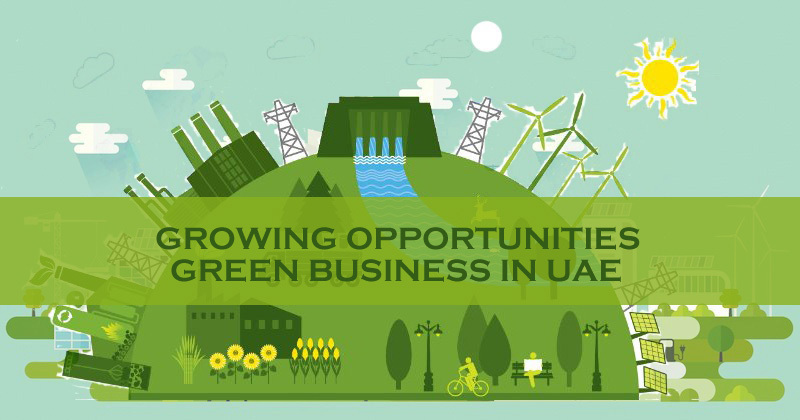 Following are few important actions that show the seriousness of the government of UAE on the path of providing facilities of green business to the entrepreneurs. These are just few of the several major steps taken by the government of UAE to enhance the green technology in the country and also to encourage businesses related to this latest and safest technology. These steps also highlight the chances of growth of environmental-friendly businesses in the state. World renowned corporations like du, Vodafone, RasGas etc. are now adopting measures in UAE to ensure their commitment to the green technology.